Shop.org gives students insights into the future of digital retail and shows how companies are applying them in today's marketplace! Students attending this event are either Ray Greenly Scholars or hand-selected because they specialize in hacking, designing, coding or programming, entrepreneurship, or any type of engineering. 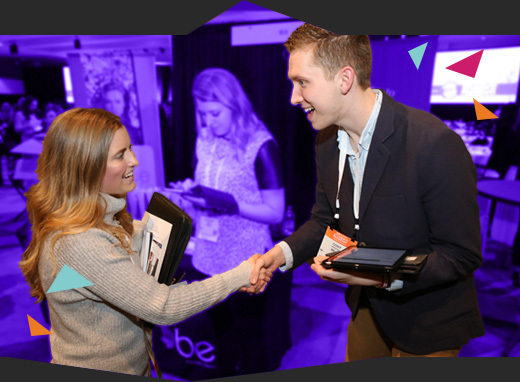 As an attendee, you'll be able to connect with the retail industry's best and learn how your skills in technology can help shape the future of retail! In addition to the Shop.org conference, we have created an afternoon of sessions designed exclusively for student attendees. Fashion Institute of Design and Merchandising, Student Lounge, 919 S Grand Ave, Los Angeles, CA 90015. Fuel up before the Student Experience starts. Lunch will be provided. What to expect at Shop.org. Matthew Meuleners, career coach and self-described GEEK, will share important lessons and soft-skills about business, leadership, relationships, and life. Students will have the opportunity to meet retail engineers, developers, and designers in small group roundtables to receive tips for a successful career. FIDM Museum, 919 S Grand Ave, Los Angeles, CA 90015. A networking opportunity for students to meet and greet retail recruiters from Kohl’s, Macy’s, The Home Depot, Walgreens, Walmart, Williams-Sonoma, and West Elm hiring for digital and technology-related internships and jobs. LA Convention Center, 1201 S Figueroa St, Los Angeles, CA 90015. Which student will leave Shop.org with $25,000 towards tuition? Find out who the top recipient of the Ray Greenly Scholarship is! Pre-selected students will interview with retail recruiters on-site for full-time opportunities and internship roles. Invitation only.